Brighten someone's day and inspire hope and new beginnings! 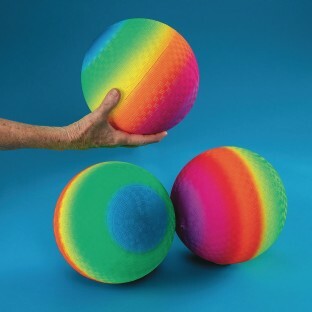 Similar to the make and feel of a playground ball but with a bright rainbow pattern sure to entice and engage even withdrawn clients. Balls arrive deflated. 8-1/2" diameter. Special Needs : Sensory Motor Skills; Rehab & Recreation : Adapted P.E.